The lens has a focal length of 8 mm. Depending on which camera the lens is used, the experienced and perceived focal length will be different. Please visit the list of compatible cameras below, it will provide the equivalent focal length you get on each camera. Text from Sigma: "Sigma’s 8mm F3.5 EX DG Circular Fisheye are a unique approach to creative photography. Images created by fisheyes are a circular, curved distorted view of reality. It allows photographers to shoot creative images by taking advantage of the acute perspectives that are invisible to the human eye. 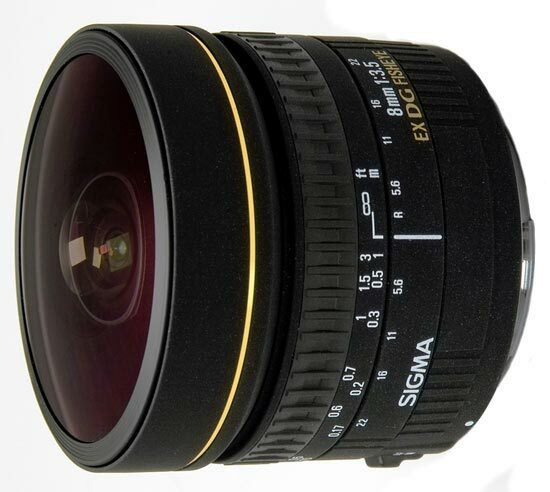 This Sigma fisheye produces a circular image with a 180º angle of view within a black surrounding frame. A minimum focusing distance of 5.3 inches and a magnification ratio of 1to 4.6 allows the photographer to have fun with placement of subjects extremely near to the camera with distorted backgrounds. For photographers looking for a creative venue this Sigma fisheye is a good choice.